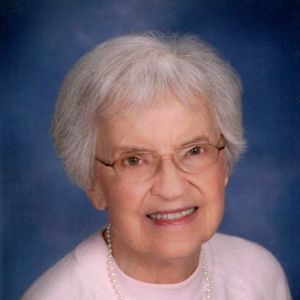 Doris Louise Roberts died on March 26, 2019 in her home at Matthews of Horicon Senior Living in Horicon Wisconsin, where she had lived with her beloved cat, Tasha, since 2013. Doris was born to Joseph and Eleanor Gehring on November 16, 1921 in Bloomer, Wisconsin. She graduated from Bloomer High School in 1939 and received her Bachelor of Science Degree from Stout State University in 1944. While at Stout she was a member of the Hyperian Society and of Phi Upsilon Omicron, a national home economics honor society. After graduation she taught home economics at River Falls High School in River Falls, Wisconsin for two years. In 1946 she married Captain Howard Roen and lived in Menomonie and Beloit Wisconsin before moving to Freeport. Doris and "Hap" had two children, Lana and Scott. Following Howard's death in 1965, after a long battle with cancer, Doris taught English at Freeport Senior High School for two years. After receiving her Master of Arts Degree in School Counseling from Northern Illinois University, she became School Guidance Counselor for Freeport Junior High School. Her final years of employment were with Aquin High School in Freeport as Guidance Counselor. She retired in 1982. In August of 1969, Doris married Paul. V. Roberts. Doris and Paul were members of St. John United Church of Christ in Freeport where she played in the original bell choir for ten years. She also served on the Church Council and was a member of Tau Alpha and Pairs and Spares. Doris was a member of The Twentieth Century Book Club and a longtime member of the 9 Hole Golf League at Park Hills Golf Course in Freeport. She loved to play bridge, read, watch sports, spend time with friends and follow the lives of her family. Doris is survived by two children Lana Kopplin, Scott (Faye) Roen, one step-son, Larry (Sheryl) Roberts, and eight grandchildren, Leah Schulte (Erin Ellis), Amy (Adam) Bloomquist, Ryan (Amy) Schulte, Nicholas Roen, Brittany Roen, Jason (Carrie) Roberts, Stacy Boomer, and Adam (Katie) Roberts. Doris had 7 nieces and nephews, and 13 great grandchildren. Doris was preceded in death by her first husband, Howard Roen, her brother and sister-in-law, Lyle and Gloria Gehring, her second husband, Paul Roberts and her son-in-law, Peter Kopplin. A memorial service will be held at St. John United Church of Christ in Freeport beginning at 1:00 on Saturday, May 4, followed by a dessert reception in the church fellowship hall. Friends may visit the family at the church from 12:00 until the service begins. Memorials may be designated to Children's Cancer Research Fund. Add your thoughts, prayers or a condolence to Doris' guestbook.